Jewish fare extends well beyond the traditional Ashkenazi knish, kneidlach and kugel. 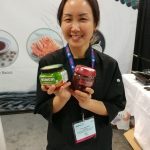 Kimchi is the latest kosher craze, at least evidenced by the throngs of those who sampled it at Kosherfest, the annual food exhibition, which this year took place Nov. 15-16, at Meadowlands Exposition Centre in New Jersey. For the uninitiated, the Korean staple is a cabbage-based food that contains white radish and spices. Kosher-certified Koko’s line also includes gochujang (fermented red pepper paste) and doenjang (fermented soybean paste). 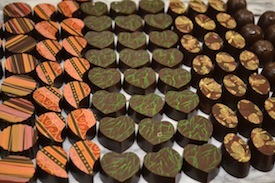 Ziporah Rothkopf, Koko’s chief executive officer, not only boasted that her creations were the first of their kind in the kosher world, but that they were also among Kosherfest’s “best product award-winners,” and that she matched mainstream kimchi’s flavorings without including the usual shrimp brine. Nearly 300 exhibitors and companies were represented from around the world, including South Africa, Sri Lanka, Great Britain, Canada, Japan, Costa Rica, Korea, Czech Republic, Ukraine and, of course, the United States. From the Philippines, FOCP presented organic coconut products, LTA Foods presented banana chips. From India came Lalah’s tamarind products, Eastern spices and Nila nuts. Australia’s MC Foods came to show off their boutique salad dressings and marinades, with the hope of finding a distributor in the Americas. From Russia came Baltika beer, said by its spokesperson to be the second bestselling brew in Europe, behind Heineken – the company produces five billion litres a year and each of the 17 beverages in the brand has kosher certification, even though beer generally does not require it. However, contrary to popular belief, nori, which is used in sushi, poses a unique kashrut obstacle, even if it contains “100% seaweed.” Rabbi Binyomin Y. Edery, the mashgiach of Kosher Japan, explained that kosher nori, despite being a vegetable from the ocean, requires a special process, as well as rabbinical supervision. Unbeknown to many, seahorses (not kosher) and various non-kosher fish eggs become intermingled with the seaweed and must be filtered out for the seaweed to be deemed kosher, a process that is not done at non-kosher manufacturing plants. The workaround for the kosher world, said Edery, is to harvest the seaweed in a certain two-hour window prior to daybreak, when the waters are coldest and the creatures are least likely to swim. Moving from ocean water to bottled water from the Czech Republic’s Fromin, which is collected from an artesian well 275 metres deep, and is sold in glass bottles that can cost up to $35 US for 1.5 litres. Available in North Africa and Europe, the kosher-certified company sought a North American distributor. According to chairman Martin Landa, although water does not require a hechsher (kosher certification), he said many consumers want to be doubly assured there are no treif (non-kosher) additives or non-kosher products made in the bottler’s vicinity. From Betula Pendula, also in the Czech Republic, comes goat colostrums – the fluid secreted by female goats right after giving birth, which is used in skin cream and immune-boosting pills. In other quasi-milk news, Israel-based Mashumashu, makers of vegetarian, dairy-free artisan cheeses, including cheddar, gouda, mozzarella and feta, showed off how their products melt easily on a pizza, and boasted that few people could tell the difference between the real deal and their cheeses. Meanwhile, the gluten-free trend has caught on with dozens of Kosherfest’s exhibitors, including Soupergirl of Washington, D.C., run by former comedian Sara Polin. She said she “sought a healthy, kosher and delicious soup” with “only ingredients you can pronounce,” so she made some. Among her company’s many products are curried split pea apple kale, lentil butternut squash, and beet gazpacho. She has been featured in the Washington Post and O, The Oprah Magazine. Also on the gluten-free train was Florida-based DelaRosa, whose executive vice-president Yehudith Girshberg claims to be the only kosher, gluten-free and organic oat producer. They also make organic wines, vinegars, olive oils and tahini. It appears as though the kosher world will soon be indistinguishable from regular supermarket fare, with the availability of kosher pepperoni and “cheese” pizza, kosher “facon,” kimchi and even duck sausage. If things continue on this trajectory, in the near future, there may be little kosher food makers can’t successfully imitate. Our Table is a beautiful hostess gift for that special occasion or that friend who loves cooking and never tires of inspiring culinary reads. There are cookbooks you whip out of your kitchen cupboard 45 minutes before dinner in search of something easy, bright and new, and there are cookbooks you take to bed with you for reading pleasure. Our Table (Artscroll, 2016) by Renee Muller falls into the latter category, not because you won’t want to try her recipes, but because there’s a lot of reading involved in many of them. Muller is a Swiss native who moved to the United States in 2002 and, by winning a recipe contest, landed a regular column in Whisk, a pullout food feature of the national Jewish weekly Ami Magazine. Our Table is a compendium of her favorite kosher recipes, “a cuisine that is heimish yet laced with aromas of my youth,” she writes in the introduction. The dishes encompass all the usual categories – soups, salads, appetizers, fish and dairy, meat, chicken, snacks, desserts and breads. Many of them are laced with stories about family secrets related to the particular recipe, or how the recipe came into being. For her fragrant standing rib roast recipe, for example, there’s an essay on how and why she created the recipe, as well as tips on how far in advance to make it and how to prevent it from drying out. Her Sugo Della Nonna (Italian-style tomato sauce) contains a half page on the definition of comfort food and the feeling it delivers when she makes it. “I see myself, sitting at Nonna’s table, as a child, feeling nourished and happy,” she writes. Muller’s insights are written in a conversational style with lots of anecdotes about her family thrown in. By the time you’re finished reading this book, you feel like you know her personally – and you can’t help but like this impassioned chef who adores cooking for her family and friends. That’s because Muller’s enthusiasm is contagious, but also because some of her dishes go way beyond the usual suspects. There is a recipe for onion crisps, a whole page on the art of roasting chestnuts, one on toffee apples, one titled “Really, really good whole wheat challah” and another for brown buttered pear salad. And the pictures? Whoa. They are amazing, mouthwatering bites of full-page color that will leave you salivating as you plan your next dinner party. Most of the recipes are not terribly complex either, they’re just new combinations of ingredients most of us know well and use regularly. Muller is that friend we all want in our lives – the one whose cooking is fabulous, who isn’t shy about sharing her recipes and whose conversation is full of funny stories, notes from her past and sage bits of wisdom. There are times when the essays feel perhaps a tad too long but, nonetheless, Our Table is a 270-page hardcover recipe book worth having, a beautiful hostess gift for that special occasion (Chanukah?) or that friend who loves cooking and never tires of inspiring culinary reads. Susan Mendelson, the entrepreneur at the helm of Lazy Gourmet Catering for the past 38 years, debuted Mendelson’s Kosher Gourmet from the kitchens at Vancouver Talmud Torah earlier this fall. Mendelson and her team of six are now serving a selection of 25 lunches a week to VTT children and offering the Jewish community their kosher event catering services, as well as the opportunity to purchase BCKosher-certified challahs, babkahs and cinnamon buns. Months ago, Cathy Lowenstein, VTT’s principal, approached Mendelson and asked her to help create a request for proposals that the school could use to obtain bids from potential caterers. “I felt this would be a great opportunity to get back into the Jewish community,” Mendelson reflected. So, she put in a proposal, her bid was accepted and she worked with the school to create a kitchen space that would work. Construction finished just as the first orders needed to be prepared, which meant the timing was tight and every detail needed attention. “When we need to order sheet pans and dishes, they have to be dipped three times in the mikvah before we can use them, so it’s much more complicated than anything I’ve done before,” she said. Step One was finding a great team. Vancouver chef Marat Dreyshner is presiding over the kitchen while his spouse Ella Dreyshner is managing the operation. Since both are mashgichim, all the kosher details are fully supervised. “They’re fabulous people and I’m lucky to have them,” Mendelson said. Students were audibly impressed by their pre-ordered meals, which were based on focus groups with VTT kids earlier in the year. Lunch options include hot dogs, burgers (made from scratch), roasted turkey sandwiches, chicken noodle soup and sushi. There are gluten-free and vegan options daily, and the Mendelson’s Kosher Gourmet team is dedicated to healthy meals, with grains made from sprouted whole wheats and treats like banana chocolate chip bread served only on Fridays. “The rest of the time, it’s Caesar salad, kale chicken wraps, Israeli salad and dishes like that,” she said. Sustainability is another key word for Mendelson, so you won’t find any take-out containers in her serving materials. Instead, the children are using regular silverware and melamine dishes for their meals. The kosher catering orders are also coming in fast, leaving Mendelson fully energized, engaged and up planning from 3 a.m. She credits Lowenstein for getting her involved. “She’s an extraordinary partner, a brilliant, kind, thoughtful and accommodating woman who is always looking at how to make things work. If it wasn’t for her, I probably wouldn’t have pursued this,” she said. Meanwhile, Lazy Gourmet Catering is still going strong with a staff of 170 and contracts for conference work downtown with Simon Fraser University and the University of British Columbia. There’s the womb-to-tomb events Mendelson’s been catering the past four decades and a new Chinese website is helping secure business from Vancouver’s Chinese community. “For one Chinese wedding, we had six days to cater for an event with 200 people,” Mendelson said. To place kosher orders, visit mendelsonskosher.ca. Lauren Kramer an award-winning writer and editor, lives in Richmond. To read her work online, visit laurenkramer.net. In the spirit of trying new things and as the New Year approaches, here is a recipe from my kosher kitchen, a slightly different take on the traditional honey cake. It’s a Rosh Hashanah favorite. Put vegetable spray on two nine-inch cake pans. Place flour, baking soda, cinnamon, nutmeg, cloves and sugar or sugar substitute in a large bowl and mix. Add vanilla, eggs, oil, non-dairy creamer and honey. Mix, then add apples. Place half of the batter in each baking pan. Bake in the oven about 45 minutes or until a toothpick inserted into the centre comes out clean. Cool. Beat cream cheese and margarine in a bowl until fluffy. Add orange peel, confectioners sugar and vanilla and blend. Add honey. Chill until firm enough to spread. Place one cake on a serving dish. Spread with one cup of frosting. Top with the second cake and spread the remaining frosting on the top and sides. The High Holidays are all about family and friends coming together and sharing a meal. Kosher Taste: Plan. Prepare. 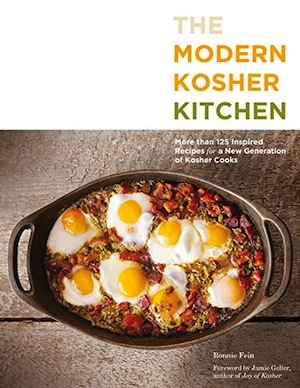 Plate (Feldheim, 2016) by Toronto-based Amy Stopnicki offers home cooks a new formula for kosher cooking, with more than 100 recipes and photos. 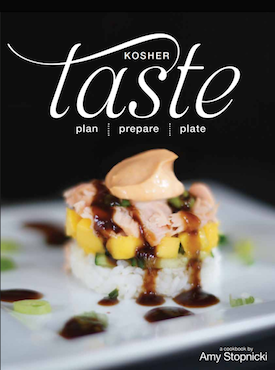 In Kosher Taste, Stopnicki has taken her best innovations from years of experience and combined them with her passion for creating balanced and beautiful meals. Every recipe offers an easy-to-follow formula. Plan: tips for preparing ingredients ahead of time. Prepare: simple instructions and a step-by-step guide help any level of home cook recreate Stopnicki’s recipes. Plate: making what you have prepared look beautiful when served and what you can serve it with. Recipes include squash zucchini soup, mango salad with raspberry vinaigrette, broccoli kugel, grilled fennel with balsamic reduction, stuffed mushrooms, salmon pad thai, wasabi tuna steaks, maple-glazed turkey breast, spinach pesto stuffed chicken, skirt steak in rum sauce, simple savory brisket, chocolate-dipped hamantashen and pumpkin pie brulée. Here are some recipes to try for the New Year. Plan: This recipe can also be baked on cookie sheets. Lightly cover the cookie sheet with oil and coat the top of each schnitzel with non-stick cooking spray. Bake at 350°F for approximately 10 minutes on each side. Quinoa flakes are a great gluten-free alternative. They are light and healthy and easy to work with and can be found in most health food stores. 1. Slice chicken breasts horizontally and pound to flatten. 2. In a shallow bowl, combine quinoa flakes, salt, paprika, garlic powder and pepper. 3. In another shallow bowl, lightly beat eggs. 4. Pour the starch on a plate. 5. In a large skillet, heat oil over a high temperature for frying. 6. Lightly dip each piece of chicken in starch, egg, and finally the quinoa mixture. 7. Fry each piece of chicken, turning when necessary. You will know it’s cooked when all sides are golden. Plate: There are endless debates on how one serves and eats schnitzel: with noodles, or salad, or even in a sandwich. Stopnicki’s favorite is Israeli-style with hummus, Israeli salad and basmati rice. Plan: This sweet treat is a great muffin to have for the kids as an after-school snack. Double the recipe and freeze them so you can take them out as needed. They thaw in 10 minutes or so. 2. In a large mixing bowl, cream eggs, vanilla, sugar and oil until mixture is light. 3. Add dry ingredients, applesauce, water and apples and combine well. 4. Pour batter into paper-lined muffin tins, filling them 2⁄3 of the way. 5. Meanwhile, combine all streusel ingredients until they achieve a sand-like consistency. 6.Pour one tablespoon of streusel mixture on top of each unbaked muffin. 7. Bake for 20-30 minutes or until the tops are slightly golden. Plate: Enjoy these alone or with a hot cup of tea. Shakshuka is not a dish that’s easy to come by in Vancouver. Until recently, that is. When Shuk opened its doors on Oak and 41st in early December, this favorite Israeli breakfast item made it to the menu, among a host of other Mediterranean foods, including house-made hummus, Moroccan fish, falafel, borekas, labneh and hatzilim. 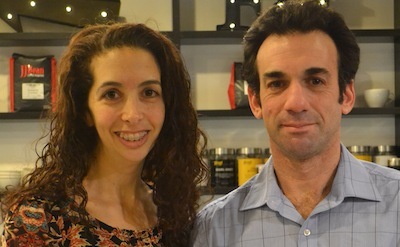 Shuk’s owner is the multi-talented Alon Volodarsky, 35, an Israeli from Haifa who moved to Vancouver eight years ago and has had careers in professional dance choreography, carpentry and home renovation. He also has owned a store selling remote-controlled toys. Soon after he arrived here, he tasted the food of chef Evy Swissa, who worked at Café 41, and quickly recognized his expertise. Volodarsky also noticed a dearth of establishments where parents could shmooze, enjoy good food and know that their kids were playing safely within eye- and earshot. So, when the opportunity arose to take over Café 41, he jumped at it. 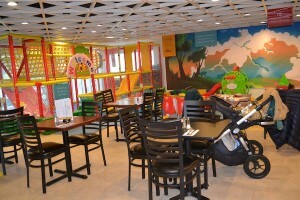 He invested $100,000 in a complete remodel and added a space for kids, with climbing structures in the large dining room to keep the 2- to 6-year-old crowd entertained. Then, he found a slab of cedar, cut and varnished it and made it a centrepiece bar in his new restaurant, Shuk. It’s a fabulous piece of carpentry. Israeli rosewater, tehina, za’atar, Moroccan spices and Turkish coffee by Elite. The kitchen is under Chabad supervision. 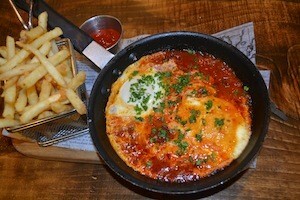 My shakshuka ($14.50) arrived on a skillet, presented on a wooden board accompanied by French fries in a neat stainless steel basket. It was also served with pita that Volodarsky was quick to point out is deliberately Israeli-style, sourced from Toronto, and hummus, which Swissa makes in five-litre quantities daily and was so good I had to bring a container of it home. Other items on the menu included the $7 boreka plate (three borekas served with boiled egg, tahini and pickled cukes), the $14.95 falafel plate (seven balls with a side of hummus, fries, Israeli salad and pita), hatzilim ($14.50, served on top of tahini with tomato salsa and pita) and za’atar focaccia ($14.50). There’s also poutine ($7.50), French toast ($8.95), eggs benedict with salmon and avocado ($14.50), pasta and wraps containing fish or falafel. The food is a mix of Mediterranean, Russian and Yemeni influences, Swissa said. “It’s comfort food that brings you back to Israel,” he confided, adding that the menu is fairly simple with daily specials bringing new items to the mix. The two specials the day I came in were Persian fish balls with couscous, spinach and carrots ($17.30) and flatbread with caramelized onion, goat cheese and pesto ($14). Don’t miss the desserts – there’s a fabulous selection of delicacies including tahini ice cream, chocolate-banana mousse cups and butter popcorn mousse. And, if you don’t have the time or energy for a Friday night meal, Swissa can handle that in a heartbeat, complete with the challah, for any orders, even as small as a family of one or two. “I need just 20 minutes forewarning,” he said. He makes 12 challot each Friday in three different flavors, and they disappear fast, so pre-orders are crucial. Shuk is open Mondays through Thursdays, 8 a.m.-8 p.m.; Fridays, 8 a.m.-3 p.m.; and Sundays, 9 a.m.-8 p.m. There is free underground parking and free wifi. Before Feb. 10, Shuk’s grand opening, access to the kids play area is free. After that date it’s $5 per child, $2.50 per sibling or $30 for a month-long unlimited membership. For more information or reservations, 604 563-4141. 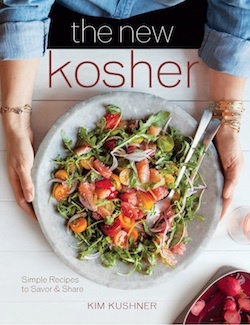 The New Kosher: Simple Recipes to Savor and Share by Kim Kushner is a beautiful cookbook with more than 100 recipes that reflect many cultural traditions. There are full-color photos aplenty (by Kate Sears), easy-to-follow instructions, and each recipe has its own brief introduction. Now living in New York with scads of education and experience behind her, including the cookbook The Modern Menu (2013), there can be no doubt that the meals, salads, appetizers and desserts in The New Kosher will make for good eating – and for good sharing with family and friends. In a food processor, combine the potatoes, onion and eggs, and process with quick on-off pulses until the potatoes and onion are chopped into small pieces, about 30 seconds. Add the flour, baking powder, one teaspoon salt and 1⁄4 teaspoon pepper and process until the ingredients are well combined, a couple of seconds longer. In a large frying pan, heat the oil over medium-high heat. Using an ice-cream scoop … scoop up the potato mixture, drop into the hot oil, and flatten with a spatula or fork to about 1⁄4–1⁄2 inch thick. Cook only four latkes at a time so you don’t crowd the pan. Once the edges are browned, carefully flip the latkes over and cook until the underside is crisp and golden, about two minutes per side. Transfer the latkes to paper towels to drain. Repeat with the remaining potato mixture. You can serve them right away, but Kushner likes to arrange them in a single layer on a baking sheet and put them in the oven for three to five minutes to give them a final crisping. To freeze the latkes, let them cool completely, then freeze them in a single layer in large lock-top plastic freezer bags for up to one month. To serve, thaw in the refrigerator overnight and reheat in a 375°F oven until piping hot, eight to 10 minutes. If you like, sprinkle the latkes with truffle salt just as they come out of the frying pan but, if you plan to do this, reduce the kosher salt to 1⁄2 teaspoon. In a large pot, combine the apples, vanilla bean and 1⁄4 cup water and bring to a boil over high heat. Reduce the heat to medium, cover and cook for 35-50 minutes without stirring. (The water will prevent the apples from scorching.) The timing will depend on how many apples you use: the more fruit, the longer the mixture will need to cook. To test for doneness, pierce the apples with a fork. They should be extremely soft and almost falling apart. Carefully remove the vanilla bean from the pot and let it cool for a few minutes. Then, using the tip of a sharp knife, scrape the seeds into the pot and discard the pod. Let the apple mixture cool for about five minutes longer. If you prefer a smooth applesauce, transfer the mixture, in batches, to a food processor, and pulse until smooth. If you prefer a chunky sauce, use a potato masher to mash the fruit to your desired consistency. Let cool completely, then transfer to one or more glass jars. The applesauce will keep in the fridge for up to two weeks. While it might be hard to contemplate cooking on these hot summer days, there are a few recent cookbooks enticing enough to draw you into the kitchen – with savory results. 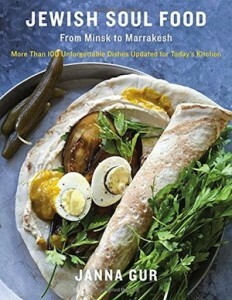 Jewish Soul Food: From Minsk to Marrakesh (Schocken Publishers, 2014) is Janna Gur’s third cookbook. It follows The Book of New Israeli Food: A Culinary Journey (Schocken, 2008), and she also edited and published Fresh Flavors from Israel (Al Hashulchan, 2010). Gur’s family immigrated to Israel from Riga, Latvia, in 1974. She completed a bachelor’s degree in English literature and art history and a master’s degree in translation and literary theory. In 1991, she and her husband founded Al Hashulchan, a Hebrew food magazine. The eight chapters include starters, salads and noshes (23 recipes); cozy soups for chilly nights (14 recipes); meat balls, fish balls and stuffed vegetables (10 recipes); braises, pot roasts and ragus (13 recipes); meatless mains (12 recipes); savory pastries (11 recipes); Shabbat state of mind (10 recipes); and cakes, cookies and desserts (20 recipes). There are 94 color illustrations, which are beautiful and mouth-watering. For me, as a cook, the three most useful aspects of a cookbook are all here: every recipe has its country of origin, a brief story and numbered instructions. And what wonderful countries of origin for these recipes – Morocco, Hungary, Bulgaria, Romania, Algeria, Libya, North Africa, Georgia, Kurdistan, Russia, Persia, Syria, Turkey, Bulgaria, Iraq, India, Yemen and America. As the book’s promotional material notes, the cuisines from most of these countries may be “on the verge of extinction … because almost none of the Jewish communities in which they developed and thrived still exist. But they continue to be viable in Israel, where there are still cooks from the immigrant generations who know and love these dishes. Israel has become a living laboratory for this beloved and endangered Jewish food.” And the hope for Jewish Soul Food is that it will help “preserve traditional cuisine for future generations” by encouraging people to cook it. For more about Gur, visit jannagur.com. And the focus is, indeed, on modern American recipes – “multicultural, innovative and interesting.” Every recipe is marked meat, dairy or pareve, and every recipe has some introductory remarks, which I think make the recipe so much more personal and interesting. As well, every recipe has a “Did you know?” or serving suggestions and substitutions. Most recipes also have a boxed tip, piece of advice. When a recipe runs to a second page, it is always opposite, so the cook does not have to turn the page while working. The 12 chapters include appetizers; soups; salads; grains, beans, pasta and vegetarian dishes; fish; meat; poultry; vegetables and side dishes; breakfast, brunch and sandwiches; budget meals; Passover dishes and desserts. Ingredients are listed in imperial measurements as well as metric. Although there are 127 recipes, there are only 39 beautiful, mouth-watering color photographs – but that is certainly not a reason to pass up this book. My only criticism about the cookbook is that the instructions are in paragraphs and not numbered, which I find easier to follow. Rounding out these reviews is not a kosher cookbook per se, however, by eliminating the cheese or using pareve chicken stock, some of the recipes could be adapted. Amy Riolo (amyriolo.com) is an Italian American whose ancestors came from Calabria. 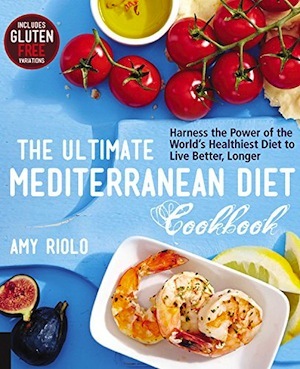 She is the author of many cookbooks, a chef and a TV personality, so I felt that her most recent publication – The Ultimate Mediterranean Diet Cookbook (Fair Winds Press, 2015) – was worth noting. The 101 recipes in this book were included because of their taste, authenticity and nutritional value. They are low in fat, cholesterol and sodium, and packed with vitamins, minerals and healthful properties. There are also seven recipes specifically listed as alternatively gluten free. The recipes are organized according to the Mediterranean diet pyramid with fruits, vegetables, grains, olive oil, beans, nuts, legumes and seeds, herbs and spices at the bottom, for every meal to be based on these foods. Above them are fish and seafood to be served twice a week. Above them are poultry, eggs, cheese and yogurt to be served in moderate portions daily or weekly. At the top of the pyramid are the least-served foods – meats and sweets. Categorizing the recipes to give the reader an idea of what is included, one can find recipes for seven soups, five fish meals, four breads, six pasta, eight appetizers and sauces, five dips, three egg dishes, one sandwich, five poultry meals, eight side dishes, eight salads, eight main dishes, nine vegetables, 10 fruit dishes and six desserts. Each recipe has a little story, the list of ingredients opposite the instructions (regrettably, not numbered) and a boxed Mediterranean lifestyle tip to “enhance the daily living aspects of the eating plan,” along with meal plans and serving suggestions. At the end are a glossary with pantry foods defined, a bibliography and a selection of websites, magazine/newspaper articles and journals for further reading. The 69 color illustrations are so tempting cooks will be motivated to rush to the kitchen to start making these dishes.